Existing control systems do not maintain uniform temperature and humidity conditions during changing environmental conditions i.e. year round, throughout the day/night. 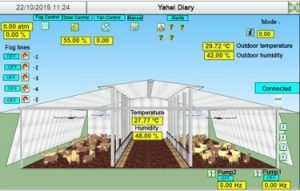 AgroAmitec- Cloud based solution that includes proprietary algorithm that manages the dynamic climate control system temperature and humidity simultaneously all year long – day and night.